At The Dental Center at Easton Town Center, we are proud to help patients achieve their perfect smiles. 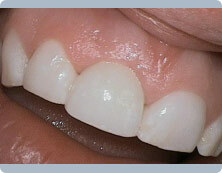 As is sometimes the case, a beautiful smile may be found through Dental Implants. There are cases when people who are missing one or even a few teeth where the services of a dental implant dentist can be the permanent solution to help fix their smiles. A Dental Implant is basically a metal screw that is inserted into a small drilled hole in the patient’s jaw. 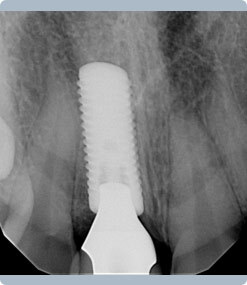 Once in place, it acts as an anchor to hold the replacement prosthetic tooth. Due to its durability, a dental implant can be utilized as a means to hold into place many different teeth, to help complete a perfect smile. After the dental implant is secured, neither the patient nor anyone else will be able to easily distinguish the dental implant from any of your other teeth. Any patient in reasonable health can be considered for a Dental Implant. The main requirement for this procedure is an adequate amount of bone in the jaw where the implant will go. However, if the jaw is lacking sufficient bone, more material can be grafted to make this a possibility for just about anyone. While grafting may be a necessity for some patients, most will be able to complete a Dental Implant procedure without it. If you have any more questions concerning your cosmetic dentistry, call us today! Can dentures replace my teeth? While dentures work for short term applications, implants are the preferred option for more permanent situations. Where a denture is meant to temporarily replace a tooth or even teeth, a Dental Implant is anchored directly to the jaw so it will stay in place for good. Additionally, a dental implant is indistinguishable from other teeth when it is implanted correctly and is the permanent solution to a problem that plagues them every day. As long as the patient is in good health, Dental Implants can be the permanent solution to dentures. Getting dental implants from The Dental Center at Easton is one of the best, most lasting ways to improve your smile. Call our Columbus office to learn more about our cosmetic dentistry practice and set up an appointment today!